This is a link up I HAD to do. My parents named me after Buddy Holly. I hate that. I get asked all the time if I was born in December. I guess you can't have the name of holiday greenery if you are born in July. You should also NOT have the name of holiday greenery if your last name is Grass. It just seems so wrong. My middle name is french. Or at least it would be if my parents didn't butcher the spelling because they wanted my initials to be HSG. I have no idea why. My sister's middle name also got butchered so we could have matching initials. Oddly enough both names started with a C originally so we could have still had the same initials. When I was pregnant I had 1 goal (ok 2 if you count getting that baby out of me) and that was to give her a name that if she didn't like she could use something else. I asked little kids named Abby if they liked their names. 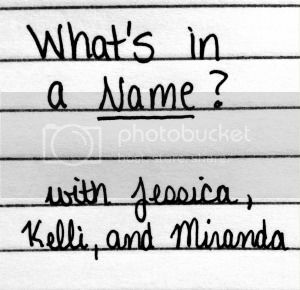 What nicknames they were called. If there was anything they would change. No one had any real complaints,so Abigail it was. But Abby never looked quit right to me, so I decided to spell it with an e. Doesn't Abbey just look better? Anyway. Abbey's dad was a chemist and we have a sense of humor. Wouldn't it be HILARIOUS to make her initials spell something? Like ATOM. Yeah we went there. Her dad chose the name Tirzah (Tears-Ah) which no one pronounces right and I chose Olivia after the a little girl I once had in my preschool class and the Olivia books. Fast forward 4 years and I am about to have another baby and all my name ideas are being shot down. I said fine, Abbey could name the baby. She was a PBS fanatic at the time and chose. Emily Elizabeth. I was at least sane enough to make her stick something in between those two so she didn't get teased for the rest of her life about Clifford. Abbey loved the move The Labyrinth so we added Sarah. But we can't stop there, because the Dragon Tales are just so cool! Lets just call her Emmy. Its a wonder she even knows what her name is. This is so cute! I love that Abbey chose the name Emily Elizabeth...and it's especially cool that you added in Sarah because of Labyrinth! I love that your kids have lots of names, they will have a lot to choose from if they decide they don't like one of them. Abbey does look better spelled with any E, something looks off without it. Haha I love Emmy's story. And I do like Abbey better with the E. What's your sister's middle name? I had a bunny named Holly once, my roommate and I got bunnies and I used to insist on naming my pets after Christmas (until Hawkeye), so they were Holly and Cinnamon. My oldest son wanted to name his brother "Hotspeeder." We... well, we just couldn't go along with that. He had some other suggestions but they were even... Well, "Hotspeeder" was the best option he gave. Emily is a lovely name and is found in lots of places, even if the original suggestion came from Clifford. Also, I love how Ashley's initials spell ATOM. Seriously awesome.